I'm currently in the throes of a toadstool obsession. After making wooden toadstools for the garden, I keep seeing mushroom potential in many everyday objects. I decided my house needs a mushroom shaped lamp, because really, what home doesn't? 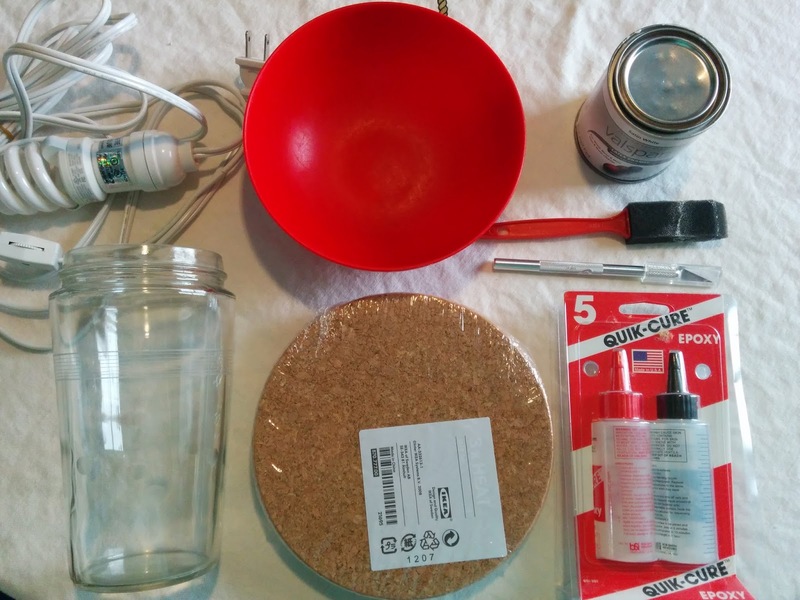 I had a lamp cord and other materials on hand, so it only cost me $1 out of pocket! You can use this light indoors or out, but if you're using it outside be sure your lamp kit or twinkle lights are for outdoor use. It's a great way to use a string of holiday lights that are partially burned out. 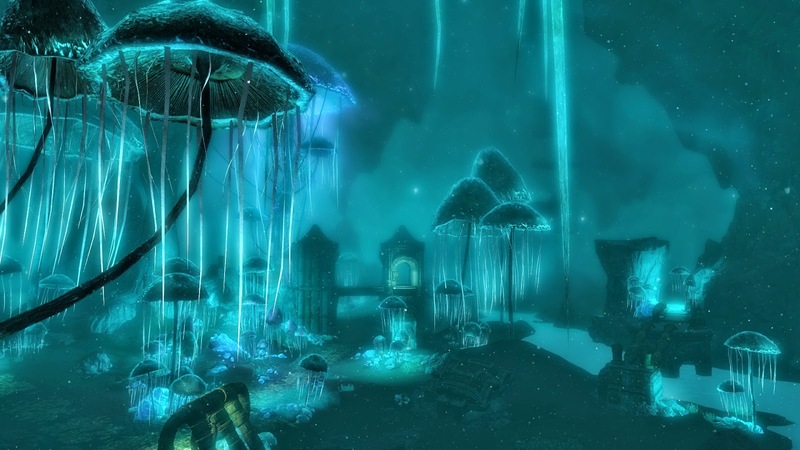 I chose a traditional red color for the top of my shade, but you could use blue, green, or purple to give your lamp a more eerie quality, like the glowing mushrooms in Skyrim's Blackreach underground area. Perfect for creepy Halloween path lights. Bowls and vases with more rounded edges could become Super Mario power up mushrooms. This would be fun for a game room or teen's room makeover. I bought my light cord set at Ikea ages ago and they don't seem to carry the same type anymore. It has a switch to turn it on/off. You can find a similar product here. 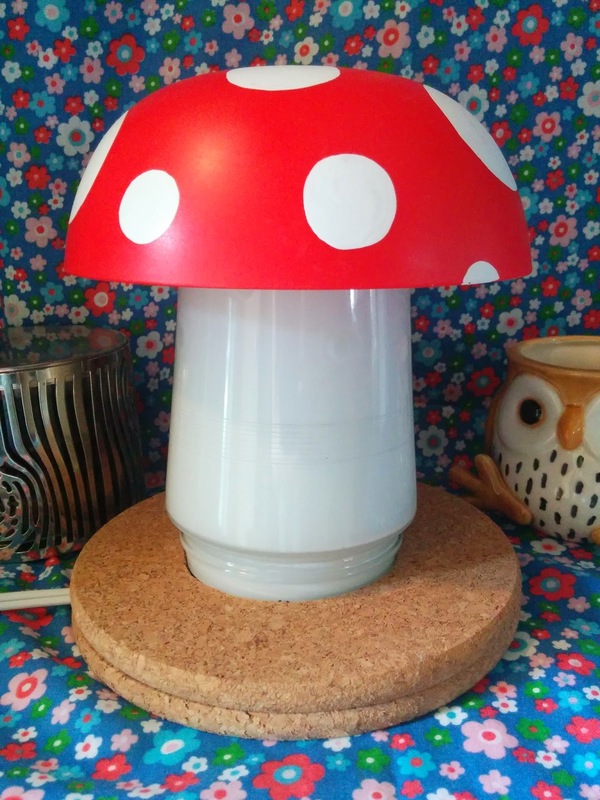 Another option is to buy a very small lamp at a thrift store, and just put your mushroom over it. Use low wattage CFL or LED bulbs to avoid overheating. If you put in a high wattage bulb this could become a fire hazard! Optional-something to make a platform under the lamp base. 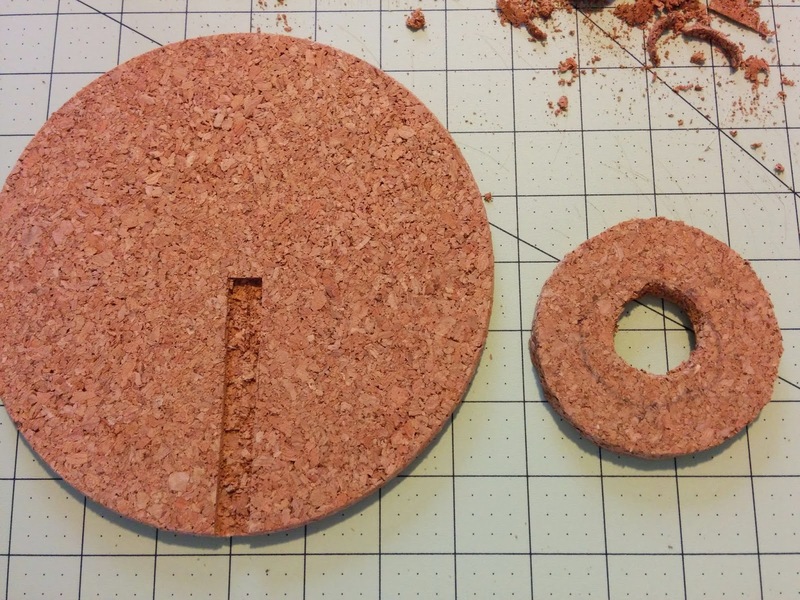 I used cork trivets from Ikea because the cork is easy to cut. If you are making a very large or top heavy project you should use wood or something with more weight. If you don't add a base to your indoor lamp, the cord won't have a nice channel to fit through, and will make the lamp tilt a bit. 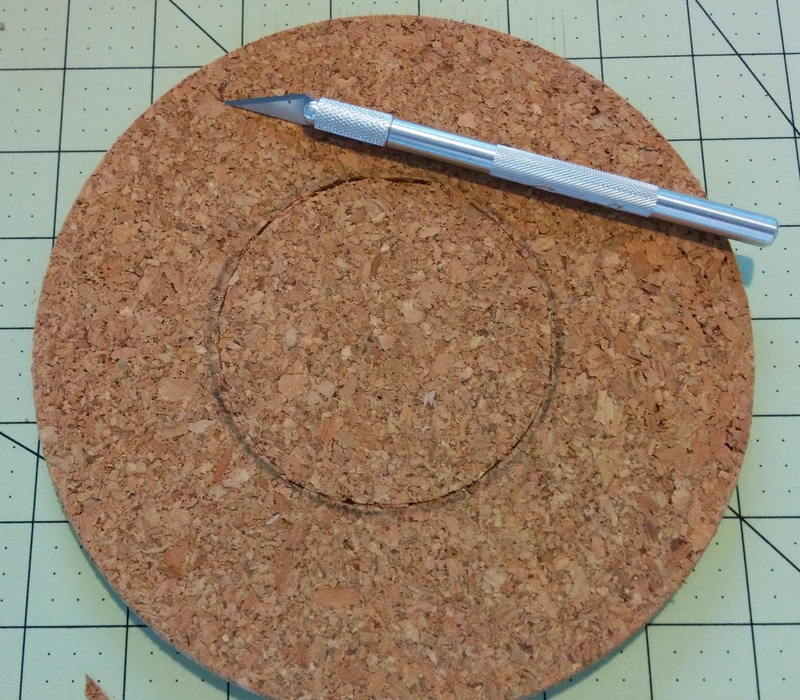 Optional-piece of sticky back felt, contact paper, or fabric to glue to the bottom of your base. This will make it look nice, last longer, and protect your table surface. Gather your materials. I bought the red bowl and clear jar/vase for 50¢ each at Volunteers of America on Indianola Ave. I was lucky to find a thick plastic bowl with such a nice smooth shape. Be creative and look in all thrift store departments for suitable pieces. Make sure they are slightly translucent. Thick pottery or stoneware won't let the light shine through. Wash and dry your bowl and vase. sides with paper, contact paper, or fabric if it's for indoor use. I poured paint inside and rotated until it was evenly coated. I poured out the excess and stood upright to dry overnight. You may need a couple of coats to ensure it's coated evenly-any imperfections will show through when the light is on, but if it's too thick it will block out all the light. Hold it up over a lamp to check the level of translucency when dry. You can always lightly sand the inside to allow more light through. Paint spots on your bowl. I describe how to do this in another post here. You can also use round white labels or cut out circles of white duct tape. If your lamp is for outdoor use skip to step 9. Trace around the open mouth of your vase on one trivet and cut out the center. Save the piece you cut out. Cut a 1/4" wide channel from the edge of one trivet to the center. Don't cut all the way through. The cord will lay in this channel. 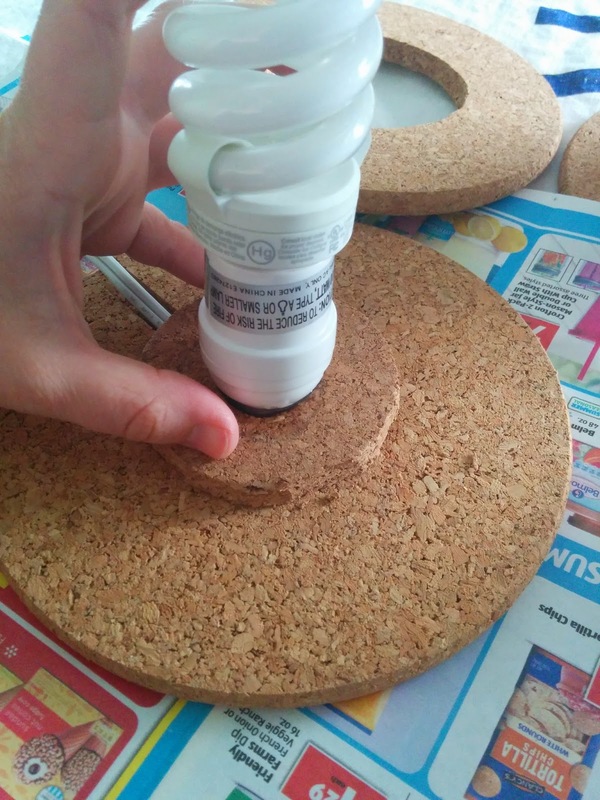 Using the piece of cut out cork, cut a hole just large enough for the lamp plug to fit through. Trim the edges so your lamp base will be able to fit in the channel between the two rings. 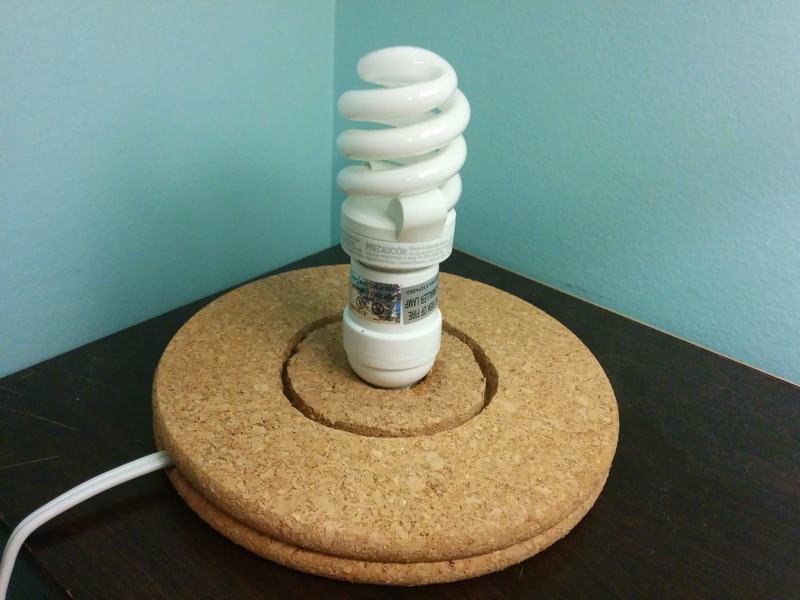 Thread the cork ring onto your cord and slide until snug around your bulb socket. Lay the cord in the channel. 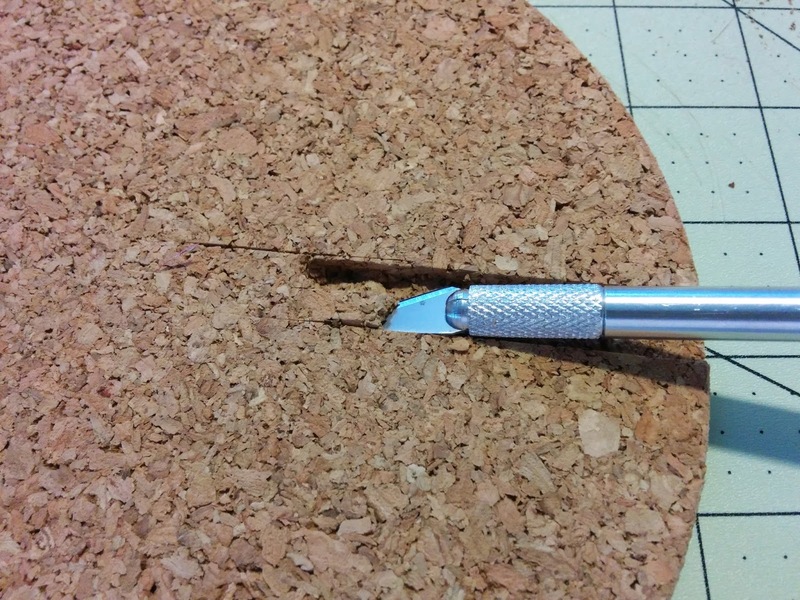 Mix epoxy and use it to glue the smaller cork ring in place as shown at right. Pour extra epoxy around the light socket base and hold upright until dry. This will help keep your bulb upright. Mix a second batch of epoxy to glue the outer ring to the bottom trivet. Lay the cord in the channel you cut through the bottom trivet. Apply epoxy and allow to dry. 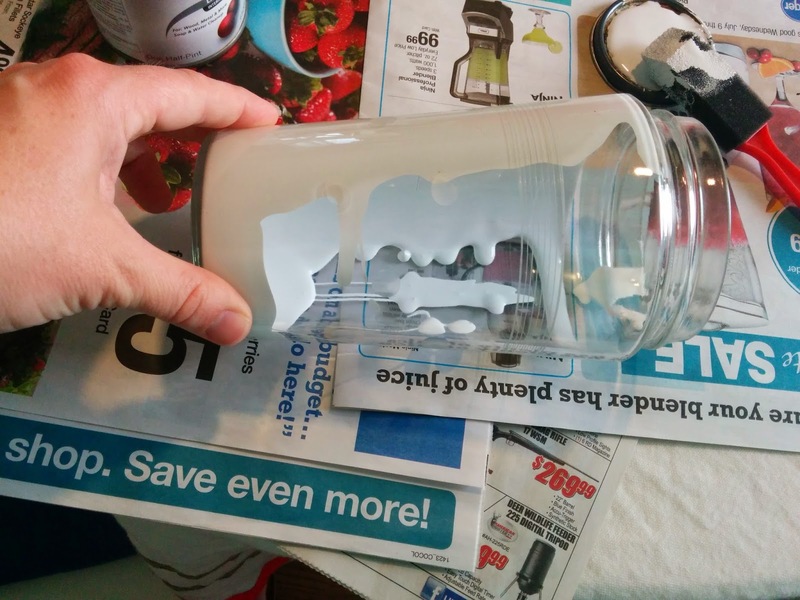 Use epoxy to glue the shade to the vase/jar. Allow to dry. 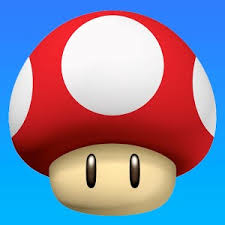 Insert bulb, put mushroom on base, and enjoy! For my next trick, I would love to make an upholstered toadstool storage footrest/stool. Oh, and a small toadstool dollhouse with natural material furnishings. A simple terra cotta planter and saucer would be a cute garden mushroom. Or maybe I have enough mushrooms in my life already? I have a slight tendency to go overboard. 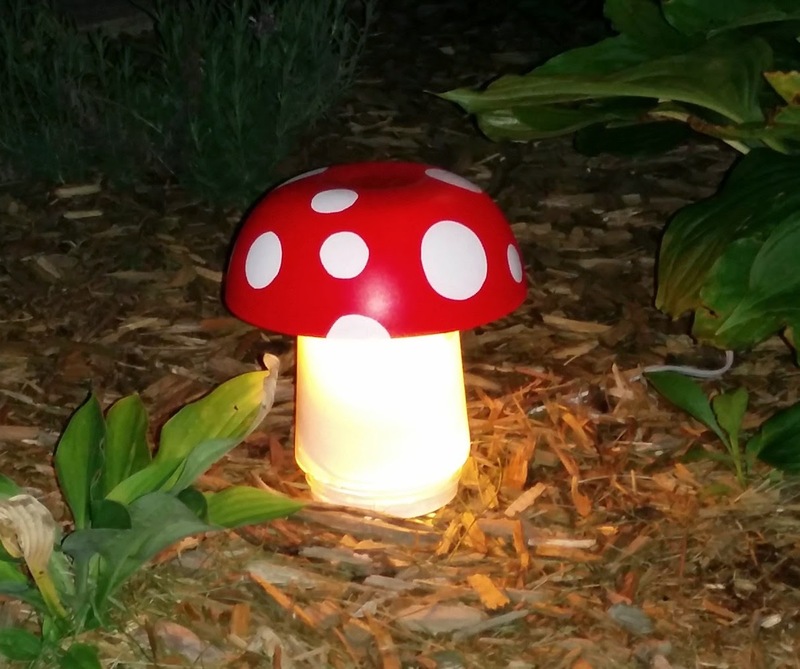 Update 5/20/15 If this is more work than you want to put into a nightlight, checkout the adorable options for under $5 on Amazon. I bought this one about a month ago and LOVE it! "Craft Bomb Your Bike" Now Available!